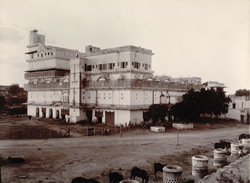 Photograph from the Curzon Collection, of the Maharaja’s Palace at Bharatpur in Rajasthan, taken by the studio of Priyalall & Company in c.1900. This is a general view of the palace from the south-east with a line of tethered horses in foreground. The palace stands within the Lohagarh or Iron Fort, a citadel in the walled city of Bharatpur. The fort was built by the Sinsini Jat king Suraj Mal (ruled 1733-63) and the palace is one of three in the fort built by the Jats between 1730 and 1850, the others being Badan Singh’s Palace, also known as the Old Palace, and the Kamra Palace. The palace has bangaldar or curved roofs and balconies supported on heavy carved brackets, both characteristic of Jat royal architecture at Bharatpur and nearby Dig.